Our PADI 5 STAR Dive Resort is ideally located in Dock Maarten, Great Bay Marina, Philipsburg on the Dutch side of St Maarten/St Martin. 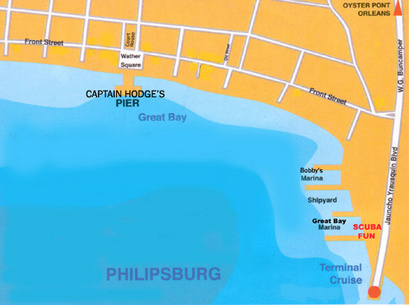 For those visiting St Maarten just for the day, we are only a 7-10 minute flat walk from the Cruise Ship Terminal. Exit the cruise ship facility, turn left on the main road and walk until you reach Dock Maarten. It is the first marina you come to on your left. Scuba Fun Dive Center is next door to Chesterfield's Restaurant in the yellow building - you can't miss us! With our 2 Custom Scuba Dive Boats, the Dive Center is just a short boat ride away from some of the best scuba dive sites in St Maarten/St Martin. Parking is available right outside the Dive Center. We also offer the best priced Round-Trip Transportation Service for local area hotels and resorts in and around Philipsburg and Oyster Pond. Please contact us for more information. If you are already on the island, drop into the Dive Center to speak to us. 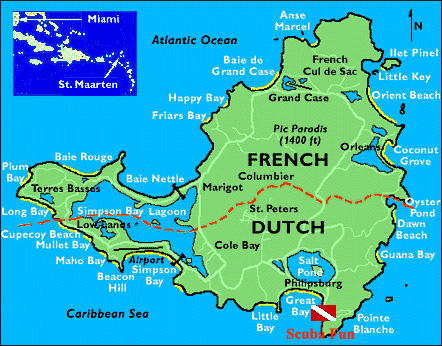 We look forward to diving with you in beautiful St Maarten/St Martin!